Looking for Best Humidifier For Baby Reviews? Reading this article and you will know many Useful things about Humidifier & Top 5 Best Humidifier For Babies. How Does A Humidifier Help The Babies? Best Humidifier For Baby – Things To Consider. Among the most common of infant illnesses are cold and throat ailments, and among the most common solutions to such problems is medication and temporary installation of a humidifier for baby in the corner of the room. These are effective solutions, but what is often not realized that the greatest effectiveness comes from the ability of the humidifier to increase room humidity to a level comfortable for the baby. Worse, most parents do not realize that maintaining adequate humidity is a full-time task – not something to be done only when the phlegm starts running and the baby starts crying. However, as with anything involving your precious little one, it is never wise to go in for a humidifier without having a thorough knowledge of its operation, the benefits to be had and of course, the nutty gritty of purchasing the most suitable unit. While humidifiers tend to be vary vastly in shape and capacity, their inherent functionality is simple and constant across virtually all products. This has allowed us to obtain information about humidifiers which can be applicable across all product categories and even climatic conditions. With a water tank that allows for a whole day’s operation on a single refill, this Honeywell product is meant to work for long hours. Equally importantly, the unit comes with a patented germ killing chamber technology that gets rid of 99.9% of all harmful bacteria within 2 hours of operation. These germ removal capabilities are further enhanced by the presence of Protec antimicrobial treated filter called HAC-50AW. 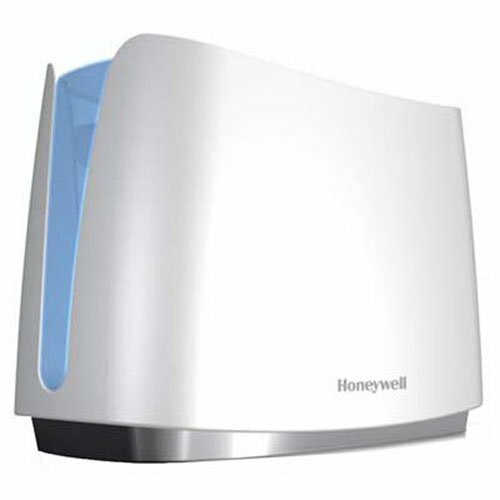 What truly sets this Honeywell product apart though is the presence of a Self Regulating Evaporative System that tracks the amount of moisture present in the air and tailors the mist production accordingly. Coupled with a renowned QuietCare system that keeps the unit quieter during operation than the average humidifier, this feature allows the unit to run with minimal supervision, thus enhancing ease of use. An all-time favorite, this TaoTronics offering comes with a remarkable 1 gallon water storage capacity and a 15 hour work cycle to match it, ensuring that the room reaches and stays at optimal humidity for long periods without the need for frequent switching on/off. Speaking of optimal humidity, the unit can achieve any humidity level between 40% and 95% with ease, even when the size of the room is as great as 538 sq ft. Top these off with a microporous cartridge and you get high quality mist that is, however, free from harmful bacteria and calcium and magnesium ions. 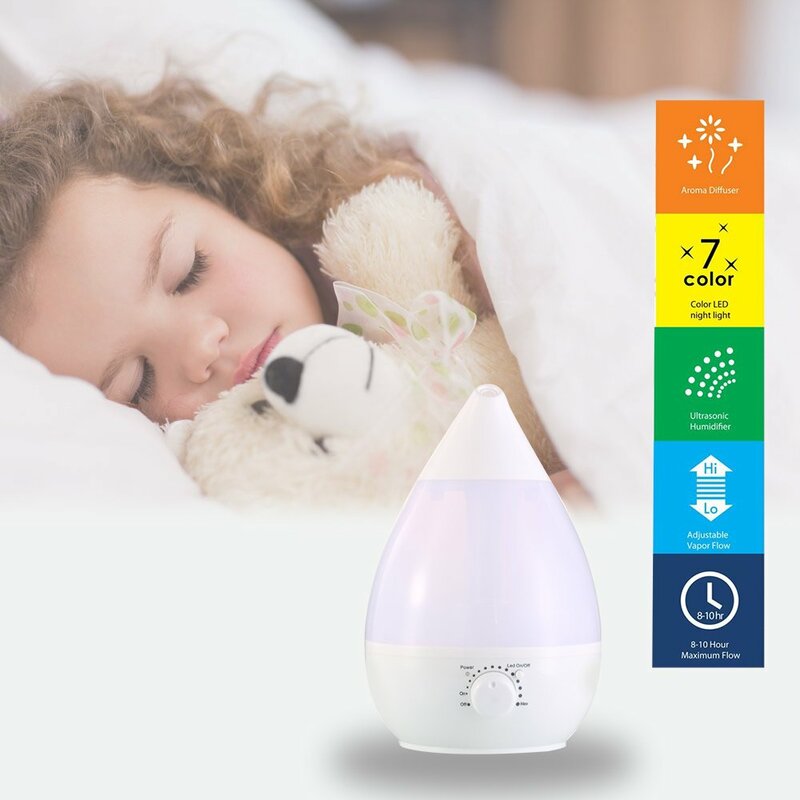 Complementing these is a versatile timer mechanism that allows users to decide the duration of misting and allows the unit to go off to sleep after this duration, or when sleep mode is activated. Regardless of the duration for which the product is run though, it maintains minimal noise levels while providing soothing cool mist courtesy of a whisper-quiet ultrasound mechanism. Last but not least, the presence of a bright LED display and handles for carrying out the water replenishment process make operation and maintenance of the unit a pleasant job. 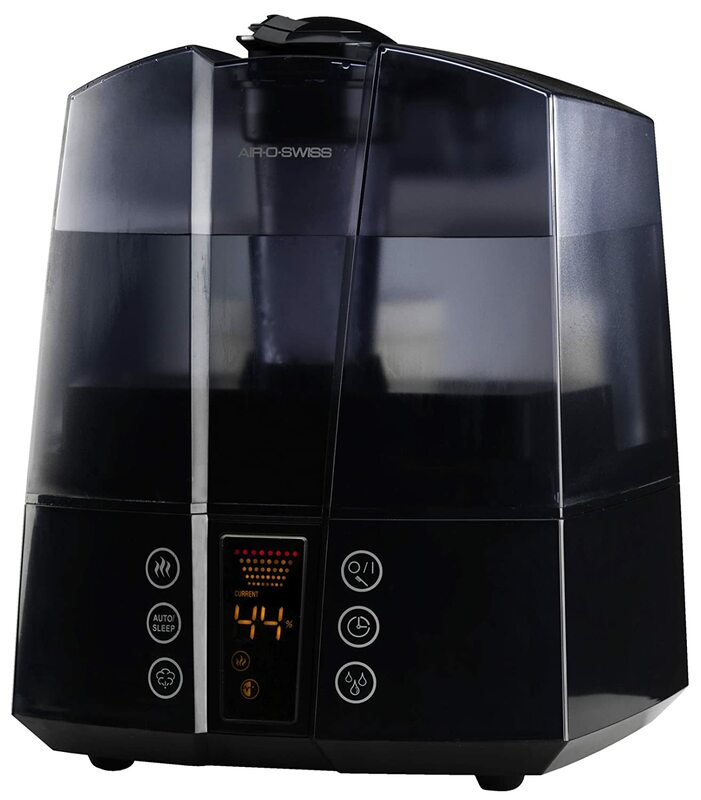 One of the few units capable of continuous operation, this Air-O-Swiss product comes with a powerful high frequency technology motor that is capable of humidifying a 600 sq ft. room with ease. Beyond mere humidification, the unit can enhance the temperature of the room by pumping out mist at 104 degrees Fahrenheit when the pre-heating option is enabled. Whether warmed or cool, the mist produced is always free from minerals and germs courtesy of an easily replaceable demineralization cartridge. 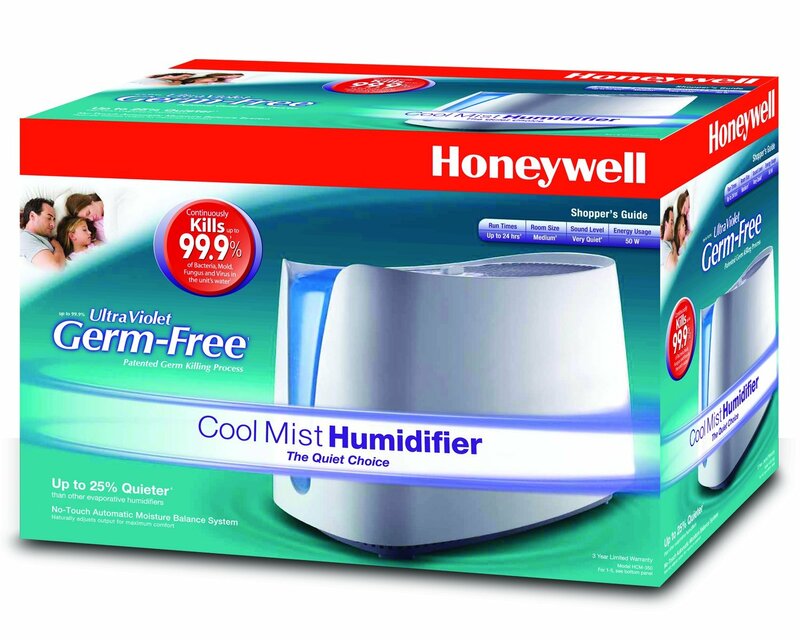 A Hydro-Cell keeps the contents of the humidifier fresh and germ-free, reducing the need for regular maintenance. Since this is an Air-O-Swiss product, it comes with ITC (Intelligent Temperature Compensation) technology that makes the unit change mist production according to the changes in ambient temperature. This feature works during sleep mode as well, thereby ensuring that one does not have to check on the baby regularly during the night. Finally, the intuitive touch controls and a 1-8 hour timer allows for customization of the functionalities without breaking a sweat. A rare example of a product that can humidify rooms as huge as 2300 sq ft., this product comes with two tanks with a total capacity of 3.4 gallons, allowing it to run continuously for 24 hours on a single refill. If refilling not be an issue, the unit can ramp up mist output to 9 gallons a day as well. Despite such high capacity, the humidifier never errs on the bacteria question since it is endowed with an Air Washing system that removes dust and pollen even as a high quality anti-microbial filter keeps the water-borne germs at bay. Interestingly, Honeywell has provided the product with unmatched customizability courtesy of a three-level output system and adjustable humidity control. With a quieter QuietCare system ensuring the baby’s aural comfort, this feature can be used to obtain just the right amount of humidity for your precious one. Compact but capable of running for a marathon 70 hours at a stretch, this PureGuaridan product’s uniqueness is further enhanced by the presence of a multi-directional nozzle that can spray mist to those specific areas that need to be humidified the most. Complementing this is the fact that the interior of the product possesses silver protection, thus insuring the mist against bacteria or mold. Alongside these features, the unit comes with an ultrasonic technology-enabled motor that ensures low noise levels during operation. With there being no filters to change, convenience of use is also among the notable points of this unit. Put simply, a humidifier is a device that adds moisture to the air in the room. Since humidity is defined as the amount of suspended water vapor or moisture in the air, a humidifier increases the humidity of the environs. Inside the humidifier is a tray of water that (most often) contains a nasal decongestant agent (like Vicks Vaporub) or essential oil. A motor inside the unit transforms the water into miniscule droplets, which are then pumped out at high speed into the air. Due to their small size, they remain suspended in the air and along with them, the agents and oil particles remain suspended too. Together, they produce a more aromatic and more importantly, comfortable environment. But why would be need to increase humidity to improve comfort ? Well, the human body – infant or adult – is accustomed to atmospheric humidity in the range of 30 to 50%. In the dry winter months (or all year long in dry climes), the humidity can drop to as low as 10%. In particular, when the air outside is cold and this cold air is heated when it enters the home, the moisture level in it drops dramatically. As the humidity drops, our mucosal membranes become dry. Such membranes line the nasal canal and various other sense organs. When dry, they tend to become easily irritated and/or infected. This can lead to itching, redness, swelling and infection. Cold and cough are only the two most common types of infections arising out of dry mucosal membranes. By keeping ambient humidity in our comfort zone, humidifiers protect us from a range of illnesses while giving us a feeling of comfort and well-being. Keeps skin moist and supple – Unlike the tough dermal membranes that cover adults, babies’ skins are very thin and hence very easily dehydrated. Such dehydrated skin can become patchy and itchy. Since babies cannot scratch themselves the way adults do, such itchiness tends to interfere with their sleep. Further, such skin can become irritated and develop infections. A humidifier ensures that the skin remains moist and any creams and lotions you apply are properly absorbed by the pores present in it. Prevents lung problems – Cold air promotes growth of viruses and at the same time dries the membranes of the baby’s respiratory passage – nose, throat and lungs. Combined together, these can lead to respiratory infections and congested passageways. Many parents learn this the hard way when despite repeated medication their child continues to suffer from the same problem. As noted above, humidifiers produce fine water droplets containing decongestant agents and essential oils. While the improved humidity keeps the respiratory system moist, the oils help retard growth of viruses and thus act as a preventive against viral infections. Prevents nose bleeds – A part and parcel of the drying out of the respiratory system, nose bleeds occur when the mucosal membranes present in the baby’s nose rupture due to extreme dryness (just like parched lips do). While not dangerous, nose bleeds can be painful for the baby and are best avoided by installing a humidifier in the room. Makes for better sleep – According to “The Happiest Baby on the Block” author Dr. Harvey Karp, noises tend to be amplified in the womb and so babies are used to sleeping in noisy environments. The gentle hum of the humidifier can help your bundle of joy enjoy a comfortable night’s rest, provided of course that the sound is not too loud. Makes hot environments tolerable – Like adults, babies tend to sleep better in hot rooms if the air is humid. This is especially true in winter when a heater or furnace may be present in the baby’s room and he/she may be wrapped up in multiple layers of clothing. Prevents static shocks – Though not a major concern, the presence of static electricity in the little one’s blankets can create uncomfortable sensations for him/her. 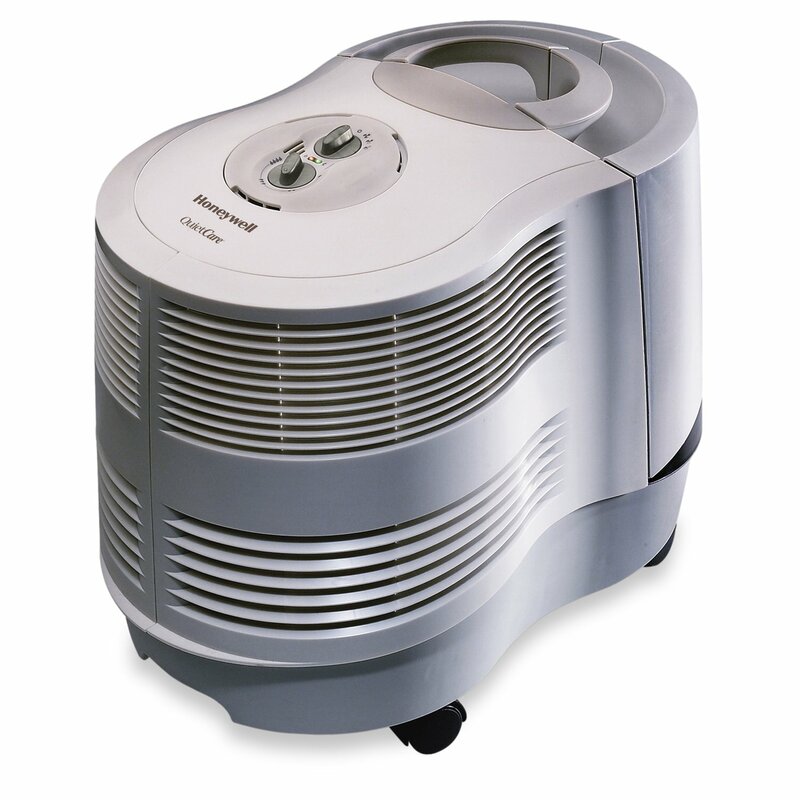 A humidifier reduces the amount of static in the room, thus reducing chances of a static shock. 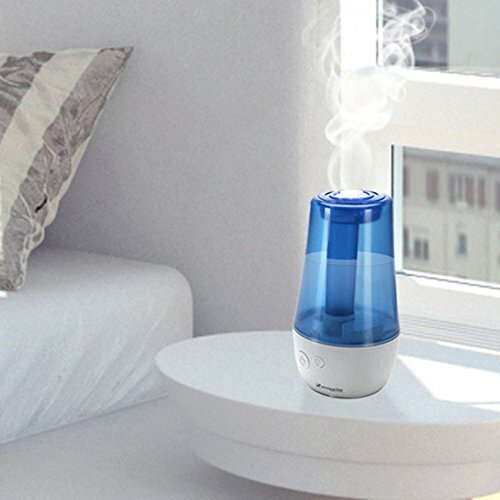 It is hard to say which type of humidifier is the best in absolute terms, since (as noted above) each variant has its pros and cons. 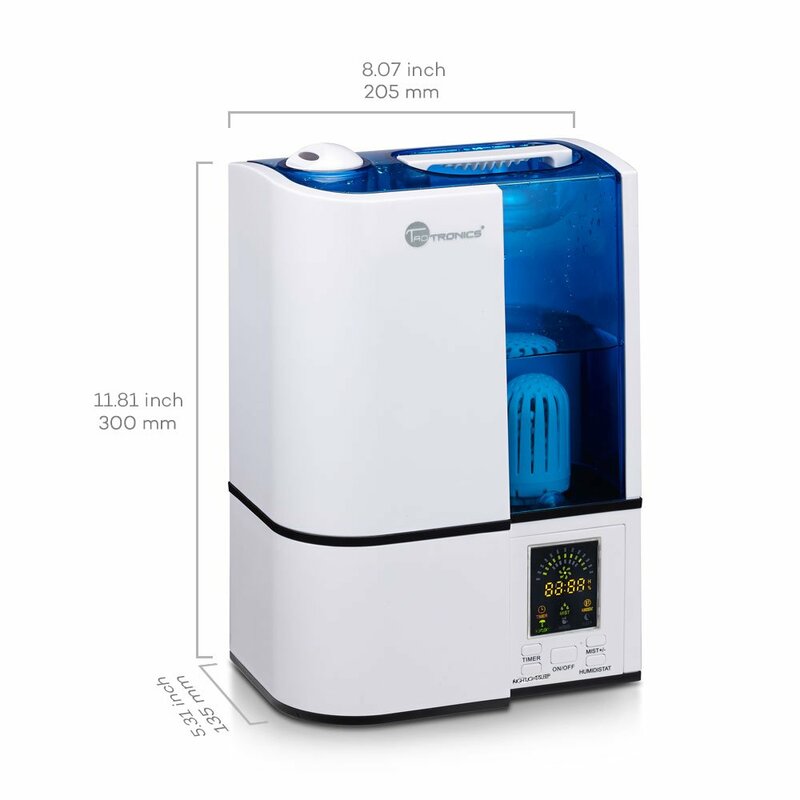 However, as far as babies are concerned, there are certain features that every humidifier should have given that the needs of babies are somewhat different from adults and unlike the latter, they are unable to express preferences. 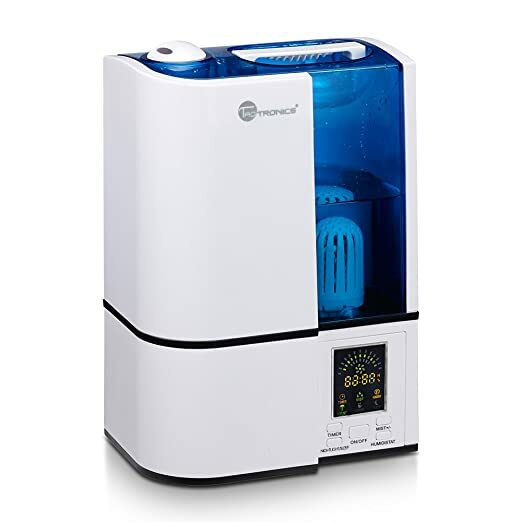 Automatic Shutdown – Automatic shutdown is a feature that allows the humidifier to stop working when the water runs out. This prevents the machine from running without water and thus burning itself out. More importantly for babies, since the noise increases when the water runs out, the automatic shutdown ensures that the baby is not unduly disturbed. Anti-microbial Features – In addition to filters, many of the best humidifiers tend to have UV lamps and/or silver ion systems that prevent growth of mold or bacteria inside the machine. This creates an additional layer of protection against the spread of germs and in doing so, keeps your little one safe and also reduces the need for regularly opening the unit and cleaning it out manually. Replaceable Filters – Some units come with permanent filters while others offer units that can and do need to be replaced. The presence of replaceable filters may be costlier but they ensure that should anything go wrong with the filter, it can be changed. Permanent filters on the other hand may not require changing but should anything go wrong, professional help would be required to replace the filter. Humidistat – Like a thermostat measures temperature, a humidistat keeps track of the level of humidity in the room. The presence of a humidistat allows the unit to figure out when the humidity of the room has reached the optimal 50% and thus reduces the chances of the air becoming oversaturated with moisture. This is especially important for babies since they are often left unsupervised. If in such a scenario the humidifier exceeds the ideal humidity levels, the baby might come down with cold and breathing problems. Adaptability to Hard Water – While mist produced from hard water is completely safe for babies, the ions in hard water can damage the filters. This may reduce the efficacy of the bacterial defense systems built into the unit. Hence, it is important to ensure that the humidifier is compatible with hard water or at least compatible with filters that can handle hard water. Noise – We mentioned earlier that the humming noise of a humidifier can make the baby feel more comfortable that he/she normally is. However, babies too have a threshold beyond which noise becomes a hindrance to comfort. Large humidifiers kept in small rooms might impact the baby’s ability to rest. Hence, while the type of noise produced by the humidifier is good, the level of noise must be kept within reasonable limits by buying a reasonably quiet unit that is suitable for the baby’s room size. Price and Warranty – A humidifier that possesses the above features must not cost more than $100 if you’re going in for tabletop models. In-duct units are a lot costlier and you would probably have to obtain professional opinions regarding the specifics of humidifiers to be used. Warranty, similarly, varies a lot. Most good models come with a warranty period of 6 months to a year, though some in-duct units might come with even lifetime warranties depending on the pricing and nature of installation. 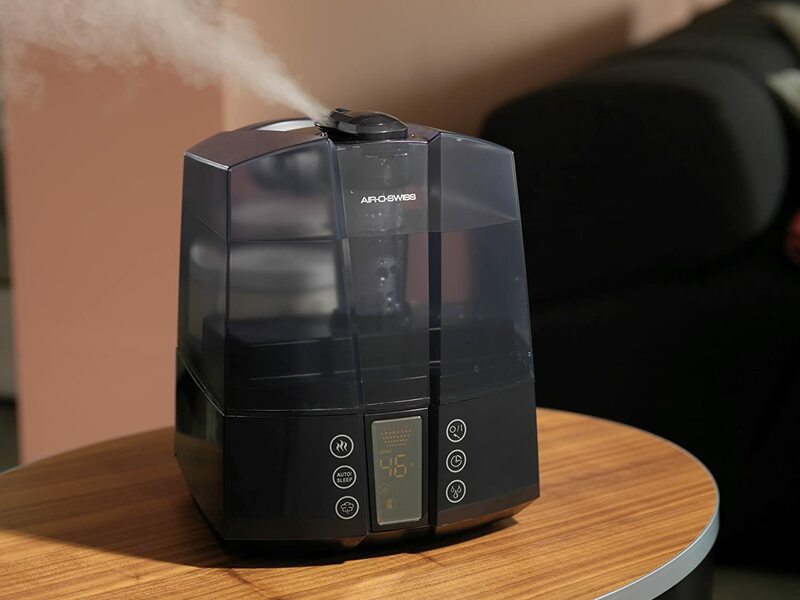 The discussion so far has focused on studying the uses of humidifier and for this reason, we’ve talked of humidifiers as a single monolithic category. In reality, however, there are various types of humidifiers in the market and it would be a capital oversight if we didn’t guide you through at least the most common types. Warm mist vs cool mist – As mentioned above, warm mist humidifiers tend to use the principles of vaporizers. However, many of them come with thermostats and other temperature regulating mechanisms that prevent the temperature from rising beyond a certain level. These are best used in situations where the air is dry but cool. Cool mist units use high pressure to change water into fine mist and hence, they do not use heat. Modern variants make use of ultrasound or chemicals to purify the water and thus prevent germs from spreading. These units are best used in conjunction with heaters or in rooms that are already warm. In-duct vs tabletop – Most of the humidifier variants available in the market belong to the tabletop variety. These units are self-sufficient and can be placed anywhere in the house. However, their water bowls have to be refilled regularly and this makes operating them a chore. In-duct options on the other hand are installed directly into the air ducts of the home and can thus humidify all air uniformly instead of starting off from the point of operation. Their filters need to be changed only once or twice a year and they tend to be more or less maintenance-free. However, in-duct units tend to be costlier than tabletop ones and are immovable. Filter vs Non-Filter units – As the name suggests, a filter humidifier contains one or more filters that cleanse the water of bacteria and in some cases, dissolved chemicals as well. Non-filter units use ultrasonic waves to remove impurities and hence, rely on physical rather than chemical processes. It is hard to say which is better in terms of results. In terms of cost though, the price of replacement filters easily makes non-filter units cheaper. Babies have the twin disadvantages of weak bodies and inability to express discomfiture clearly. Hence, a good amount of “what is good for baby” is a combination of conjecture and expert opinion from those who have experience handling infants. This being the case, it may well be the case that despite our most earnest endeavors to provide the most accurate guide, your child’s needs and desires might be at variance with both expert opinion and our own understanding of the concept of dryness and utility of humidifiers. Keeping this in mind, we would suggest carefully observing the child in the early stages of humidifier use to ensure he/she is comfortable and furthermore, being prepared to change the unit should the results be at great variance with expectations. ​All considered though, we do believe the above guide is a good starting point for determining which is the best humidifier for baby. Coupled with careful consideration and observation of the child, the above paragraphs should be able to provide your baby with the comfort and rest that you dearly wish to provide him/her. Buying Guide for Best Pack and Play. Graco Pack n Play Playard.